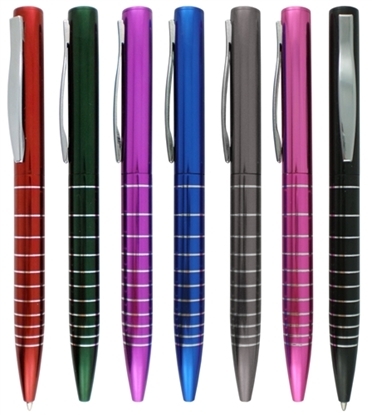 The Tahoe Pen has single color printing in an assortment of colors. Beautifully designed with silver accents. 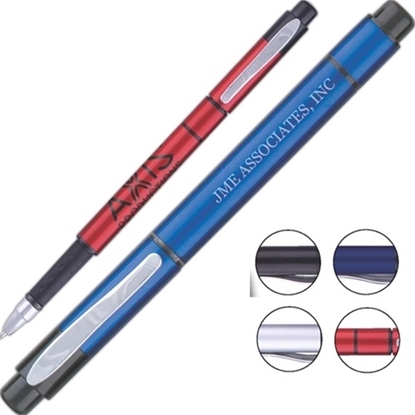 The Aveo Pen has single color printing in an assortment of colors. Chrome and rubber accents. The Admiral, holds true it's name. This is a click action, brass metal pen. It's professional look, makes a mark with those who use it. It flaunts a lacquered barrel, black rubber grip and chrome accents. 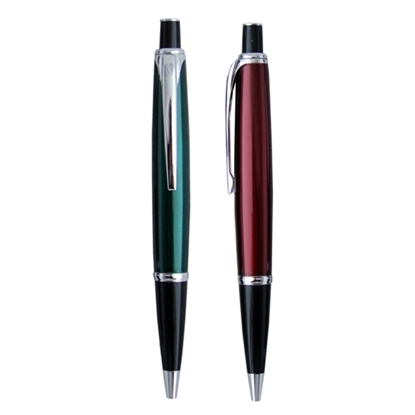 The Missile Pen is a click action, brass ballpoint pen with lacquered barrel and chrome accents. 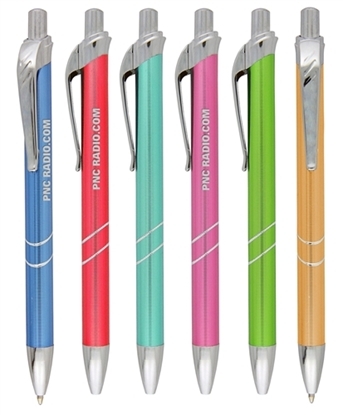 The Richard Pen has single color printing in an assortment of colors. Black grip and silver accents. 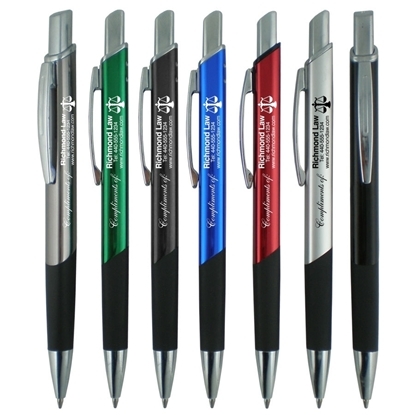 The Regency Grip Metal Pen has single color printing in an assortment of colors. Ribbed thumb grips and chrome accents. Individually poly-bagged. 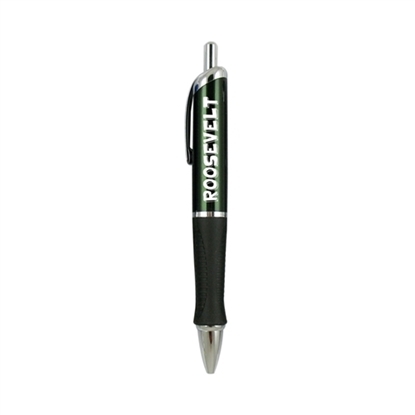 The Daisy Pen has single color printing in an assortment of colors. Silver accents. 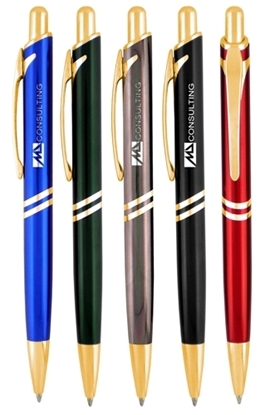 The Virginia Pen has single color printing in an assortment of colors. Metallic barrel. Black rubber grip. Chrome accents. 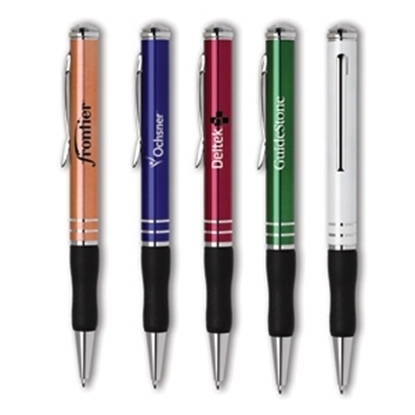 The Torrey Pen has single color printing in an assortment of colors. Beautifully designed with silver accents. 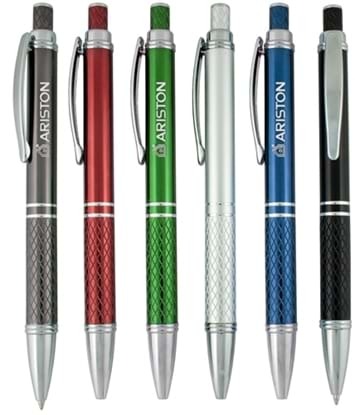 The Arken Pen has single color printing in an assortment of colors. 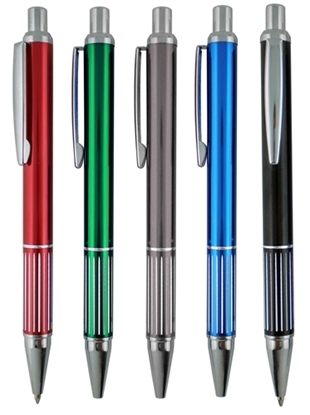 The Newport Empire Pen has single color printing in an assortment of colors. Silver accents. 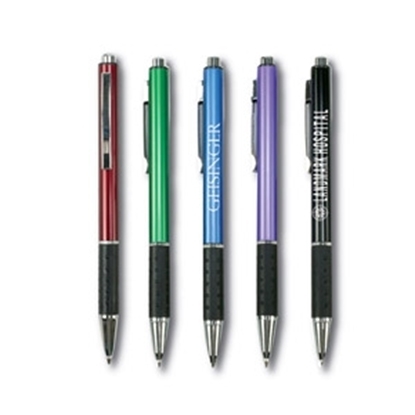 The Previa Pen has single color printing in an assortment of colors. Silver clip and accents. 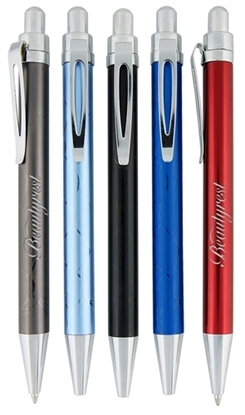 The Berkley Pen has single color printing in an assortment of colors. Gold or Silver clip and accents. 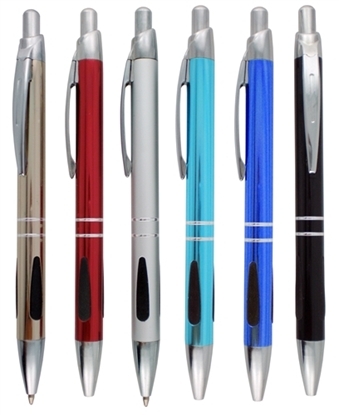 The Tech Metal Pen has single color printing in an assortment of colors. Beautifully designed with silver accents and rubber grip. 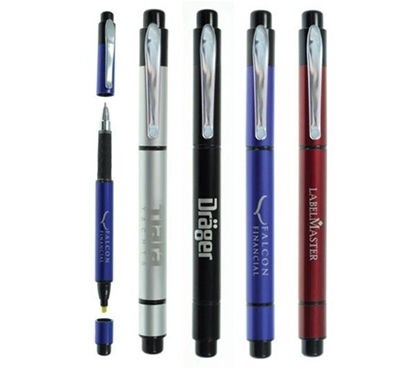 The Camden Pen has single color printing in an assortment of colors. Chrome clip and accents. The Coburg is a twist action, aluminum ballpoint. It has chrome trims. Price includes one location imprint or laser engraving. After laser the logo will show matte silver finish. 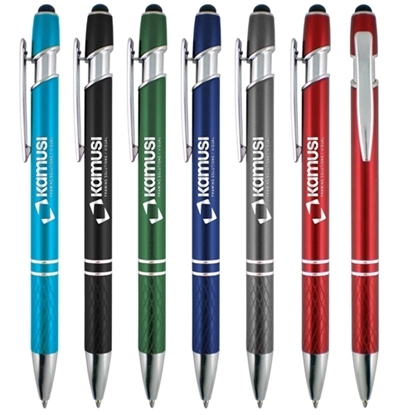 The Regency Grip Metal Pen has full color digital printing in an assortment of colors. Ribbed thumb grips and chrome accents. Individually poly-bagged. DUO II - Not your ordinary hi-lighter/gel pen combination. Metallic finishes bring a sophisticated look to your desk. Highlighter / Pen Combo. 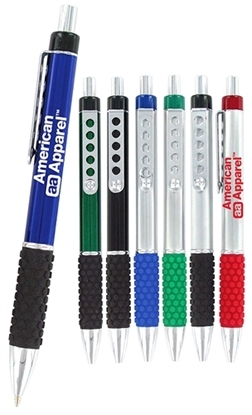 The Camden G Pen has single color printing in an assortment of colors. Gold clip and accents. 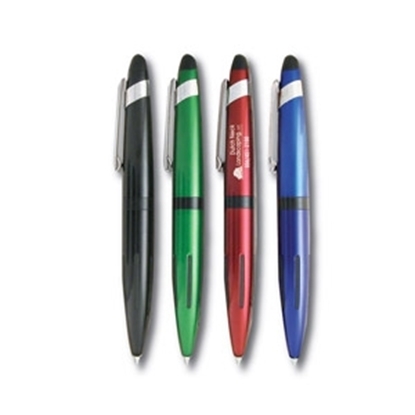 The Meryl S Pen has single color printing in an assortment of colors. Silver clip and accents. A polished metal pen with a quick-click plunger that doubles as a stylus, the Tres-Chic Stylus pen is ideal for any user with a touchscreen device. Available in a variety of vibrant, gleaming barrel colors, this medium ballpoint pen can be customized using LaserMax (R), a laser engraving process that yields the largest standard imprint area in the market. 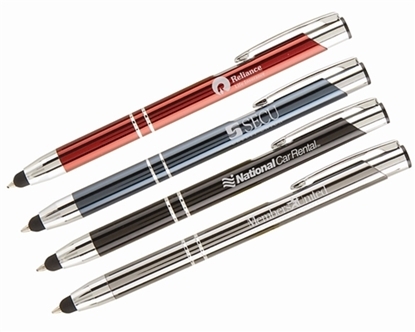 The custom imprinted Rita Mettalic Metal & Stylus is one of the most up-and-coming promotional products in the industry. 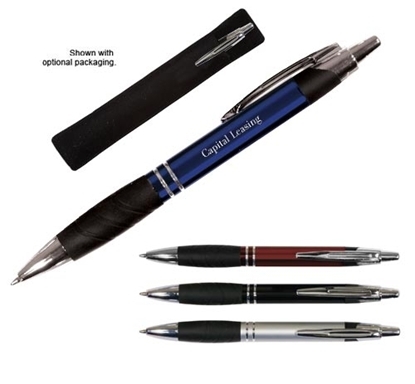 A classy slim style Click action mechanism opposite rubberized stylus includes a standard ballpoint ink cartridge for writing on most surfaces. The stylus is compatible with all of todays tablets & smartphones. This metal/stylus pen comes with 3 lines of Laser engraving free! Metal,click pen. Rubber grip, for comfortable writing. Absolute minimum is 100 pens. Please call or chat for pricing. Individually poly bagged. Eco-friendly! Recycled aluminum barrel with black trim on caps. Pen/highlighter combo! Individually polybagged. 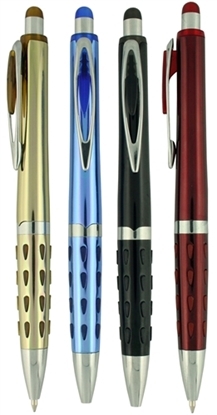 The custom imprinted Samster Metal Pen is a beautiful item that is sure to make impressions in any environment. 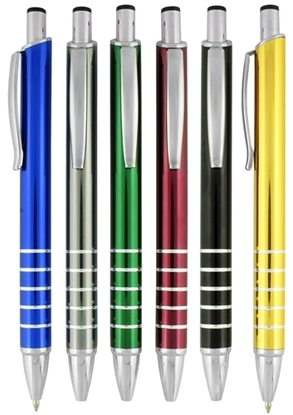 This pen has a squared chrome colored barrel with a metal clip, chrome accents and a rubber grip area. Includes 3 lines FREE Engraving! 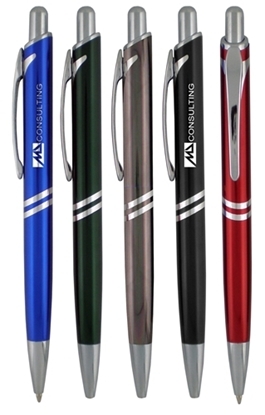 The Meryl G Pen has single color printing in an assortment of colors. Gold clip and accents. Large, metal pen. Comfort grip area. Individually poly bagged. 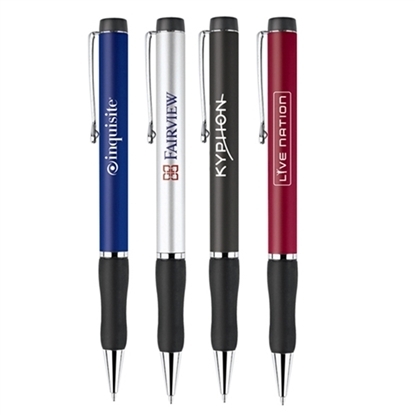 Mypromotionalpens.com offers the largest and best priced selection in Promotional Engraved Metal Pens. We will price compete and we won't be under sold. 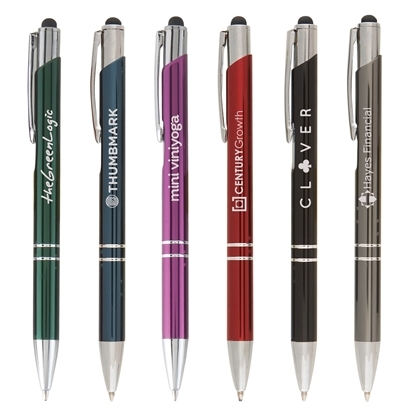 Let our graphic designers make your personalized Engraved Metal Pens standout above the crowd at no charge. We won't stop until you are completely satisfied with your custom Engraved Metal Pens art proof.Use category search filters on your left to help narrow your search to find exactly what you are looking for.